We’d love your help. Let us know what’s wrong with this preview of Before Dawn by Elizabeth Arroyo. While Zoe has abilities she cannot explain, just getting through another day without being killed is a challenge. She has survived since her mother’s murder with help from an unexpected ally, Survival rule number one: eat before being hunted. 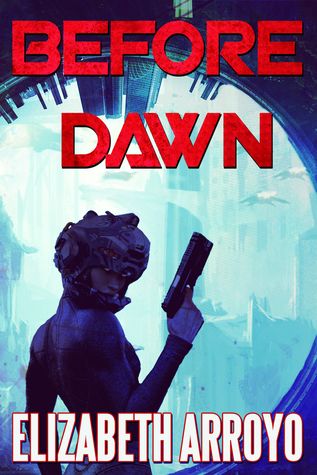 To ask other readers questions about Before Dawn, please sign up. I received a copy of this book, with thanks, from Xpresso Book Tours in return for an honest review. My opinions are my own and are not influenced by this. This book did not live up to its potential. There was a lot going on and I couldn't grasp even half of it. I'm so flustered by the confusion I don't even know where to start. It feels like you've missed the 1st book or a prequel the way it starts out. There's a lot of explaining that slipped past my attention, overwhelming enough for me to not be bothered as to whether there were even any plot holes. There were many instances where characters did not exhibit any emotional reactions where it was needed. And many others where I was surprised and confused by the MCs contradicting reaction, where I went 'Wait. I thought he/she was the enemy?! Why are you trusting them all of a sudden??' or vice versa. They kept oscillating between a character being the enemy and the friend, back and forth, back and forth, so much so that I gave up on trying to figure where they stood on my own. There's attraction between the two MCs but they never come to trust each other throughout the ENTIRE novel. On top of that, Zoe is thrown in with two other guys where we're not sure if there's supposed to be 'something'. The world as we know it no longer exist, people now live in space and the Earth is filled with violent hybrids. After the dangerous infection people genome has fused with other animals and the outcome isn't pretty. Living in the midst of that is Zoe, she has interesting ability, that she shouldn't have. She spent last year and a half surviving along side two guys that use to work for Arcane. But it's not all that simple, when everyone is hiding something. It very interesting premise with a lot of very interesting elements, but it lacked depth and a bit more of explanation. I was often lost and not sure what is happening. There is non stop action, what I love, but the pace is at expense of the details, that would make story really amazing. Elizabeth spent most of her younger years as an avid reader with a wild imagination which led her to write her first manuscript at the age of fourteen. Her fascination with the paranormal was influenced by the vivid ghost and demon stories her father told her as a child, scaring the crap out of her. It also led her to ask the "what if" question that propelled her down the path of the fantastical. Elizabeth spent most of her younger years as an avid reader with a wild imagination which led her to write her first manuscript at the age of fourteen. Her fascination with the paranormal was influenced by the vivid ghost and demon stories her father told her as a child, scaring the crap out of her. It also led her to ask the "what if" question that propelled her down the path of the fantastical. But, life got in the way. Elizabeth completed a Bachelors degree in Psychology with a minor in Criminal Justice at Northeastern Illinois University and works in the community strengthening families. Her love of stories held, and in 2008 she found herself back into her storytelling roots and began writing again. Since then she's published a short story in SQ Magazine, countless musings on her blog - Chandara Writes, and completed three manuscripts. In 2012, Elizabeth signed with Sapphire Star Publishing to release her debut novel, THE SECOND SIGN, a Dark YA Paranormal Romance, slated for an early 2013 release.